Tesla shares rose to $313.38 on April 11, giving the company a market capitalization of about $51 billion, surpassing GM for a moment as the most valuable American automaker. This left some industry insiders wondering about tulip bulbs. “It’s either one of the great Ponzi schemes of all time, or it’s all going to work out,” mused Mike Jackson, CEO of AutoNation, the largest dealer group in the US. He was speaking at a conference hosted by the National Automobile Dealers Association and J.D. Power. “It’s totally inexplicable, as far as its valuation,” he said. But he was wrong. It’s not “inexplicable” at all. It’s very explicable. Tesla makes some nice cars, as you’d expect from a company that charges an arm and a leg for them. But Jackson’s statement wasn’t about its cars, their quality, or electric versus internal combustion engines. It was about Tesla’s market capitalization of $51 billion. The company has accomplished a lot: Electric cars have been around for longer than internal combustion engines. When they first appeared in the 1800s, they competed with steam-powered cars and horses. What Tesla has done is put them on the map. That was a huge feat. Now every global automaker has electric cars. They all, including Teslas, still have the same problem they had in the 1800s: the battery. But those problems – costs, weight or range, and time it takes to charge – are getting smaller as the technology advances. And the competition from the giants, once batteries are ready for prime-time, will be huge, and global. So in March, Tesla sold 4,050 new vehicles in the US, according to Autodata. All automakers combined sold 1.56 million new vehicles in the US. This gave Tesla a record high market share of an invisibly small 0.26%. Volume-wise, it’s in the same ballpark as Porsche. GM sold 256,007 new vehicles in March, for a market share of 16.5%. In other words, GM sold 63 times as many new vehicles as Tesla did. For percent-lovers, that’s 6,221% more. Even if Tesla quadruples its sales in the US, it still will not amount to a significant market share. We constantly hear the old saw that stock prices reflect future earnings and/or cash flows, and that looking back ten years has no meaning for the future. 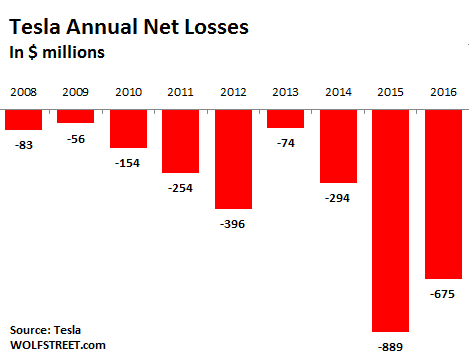 Alas, after 10 years of producing losses, Tesla shows no signs of making money in the future. It might instead continue burning through investor cash by the billions. Based on the logic that stock prices reflect future earnings, its shares should be at about zero. 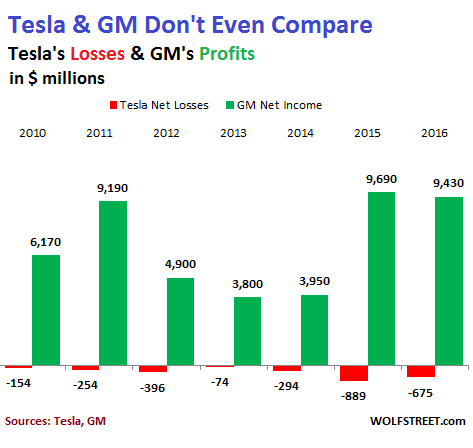 However, unlike GM, Tesla hasn’t gone bankrupt despite its massive losses and negative cash flows. Why? Because Tesla is able to extract new money from investors and lenders. So it won’t run out of money. As it burns that cash, it gets more cash so that it won’t have to go bankrupt. Companies only go bankrupt when investors and lenders, trying to cut their losses, say, “no more.” Then the money-losing companies cannot fund their operations any longer and instead hire bankruptcy lawyers. That’s what happened to GM during the Financial Crisis. It was losing a lot of money. At one point, lenders and investors said, forget it. If lenders and investors someday decide to pay attention to Tesla’s losses and cash-burn, they too might walk away. But that’s not going to happen in this stock market. For GM, it too took a special event: the Financial Crisis. In comparison with GM, Tesla is ludicrously overvalued. But it’s not “inexplicable.” It’s perfectly explicable by the wondrously Fed-engineered stock market that has long ago abandoned any pretext of valuing companies on a rational basis. And it’s explicable by the hype – the “research” – issued by Wall Street investment banks that hope to get fat fees from Tesla’s next offerings of shares or convertible debt. The amounts are huge, going back ten years: Last month, Tesla raised another $1.2 billion, after having raised $1.5 billion in May 2016. There will be more. Tesla is burning a lot of cash. Investment banks get rich on these deals. The bonuses are huge. So it’s OK to hype Tesla’s stock and sell it to their clients. Everybody wins in this scenario – except for a few despised short sellers who’re hung up on their silly notion of reality. As long as shares continue to rise, the whole equation is perfectly validated: Let the doubters and short sellers stew in their own juices. Shares will rise because stock jockeys expect them to rise, and with that expectation, they buy them and drive up their price. Buy-buy-buy turns into a self-fulfilling prophecy. It won’t last forever. But until then, market share, profits, or anything else vaguely linked to reality simply don’t matter.